Is the party over for Center City retail? Those fancy suits in Armani Exchange at 1429 Walnut St. are no more. Bala Cynwyd's dying main street: Will $100 million save it? And don't count on buying jeans in True Religion at 1604 Walnut. That, too, has closed. Nine West at the Shops at Liberty Place went dark last month, and some say Guess at 1520 Walnut is heading there too. And the Bellevue at 200 S. Broad St. is still looking for a replacement for Polo Ralph Lauren nearly six months after it closed. Whether it's too much supply, national brands closing stores, fierce local competition, online shopping, or all the above, a trend is emerging downtown that has not been seen in a while: empty storefronts. Worse, the vacancies are taking longer to fill, say top city brokers, threatening a retail resurgence that began about five years ago and peaked last summer with record rental rates along Walnut and Chestnut. Those streets are the heart of the Rittenhouse shopping district often marketed as one of Center City's top attractions. "Center City retail is likely going through an identity crisis, which compounds the issues facing all of retail," said Joel Naroff, of Naroff Economic Advisors Inc., in Holland, Pa. "The revitalization process is attracting a wide distribution of individuals and families into the city, and it really isn't clear how all of this will work out. "We just don't know what type of retail demand is needed for the new urban gentry," he said. "It also isn't clear how many retailers can be supported, given the changing pattern of demand." True Religion at 1604 Walnut St. is closing. Retail rents are down about 10 percent this summer over last for the first time after several years of an upward trajectory, according to citywide sales and leasing data. Mid-block rents in the last year on Walnut Street – from the 1400 to the 1700 block – are $100 to $150 per square foot, compared with $130 to $170 per square foot last summer. Premium corners, where retailers like Rag & Bone and Under Armour sit, average from $185 to $200 per square foot and have not been affected. Meanwhile, the rents mid-block on Chestnut Street, from the 1500 to 1700 blocks, now average between $60 and $75 per square foot, compared with $65 to $85 a year ago. Corner spaces on Chestnut are about the same, averaging between $90 and $100 per square foot. Experts say the perfect retail storm has hit downtown urban areas. And even prosperous ones like Manhattan and Center City Philadelphia, where there is more supply than ever, are beginning to see empty stores. More than 2.1 million square feet of retail has been added in the last five years within the city's central business district or in adjacent neighborhoods, according to the commercial real estate firm JLL. This figure includes 730,000 square feet from the former Gallery at Market East, a mall that is being fully renovated and is now being retooled even before it opens. The project was originally to have been called Fashion Outlets Philadelphia, Owner Pennsylvania Real Estate Investment Trust and partner Macerich have renamed it Fashion District Philadelphia to put less of a focus on outlets shopping and more on entertainment and dining, with a new movie theater. The added supply arrives as retailers are trying to adjust their store footprints with an ever-growing online shopping world. On the other end, hundreds of national chains – the bulk of which sell apparel – are in the grips of bankruptcy or are closing stores. They include Ralph Lauren (closing 50 stores including its Fifth Avenue flagship in New York City), Nine West (shuttering all 25 remaining stores), and True Religion (closing at least 27 stores, including the one on Walnut Street). Brokers confirmed last week that the space for Guess at 1520 Walnut is being marketed, which means there is speculation it too will close soon. "There's an identity crisis with retailers trying to figure out who they are," said Scott Benson, senior sales associate for Metro Commercial, which handled several retail deals along Walnut and Chestnut Streets this year. "It's almost as if retailers are resetting their fundamentals and trying to find the best new way to make a profit. We can expect to see more of that." Shai Benson carries an H&M shopping bag near Rittenhouse Square, where several big name brands have recently closed. The empty stores have not been lost on Paul Levy, president and chief executive officer of the Center City District. Though mum on details, Levy said he will unveil an initiative next month to improve the city's retail environment. "Any time there are vacancies, it raises concerns," Levy said. The new reality was evident in the response of Maureen Weir, marketing director at the Bellevue and the Sporting Club at the Bellevue, explaining why a new tenant has not been found for the Ralph Lauren that went dark March 5. "Despite interest from a number of potential tenants, the decision has been made to develop a full retail strategy for the property" involving "new concepts, not just for this specific location, but throughout the entire complex," Weir said last week. She said further details would be shared in late 2017 or early 2018. The former Polo Ralph Lauren space at the Bellevue is still empty after almost six months. There are still many signs that Center City remains highly attractive. 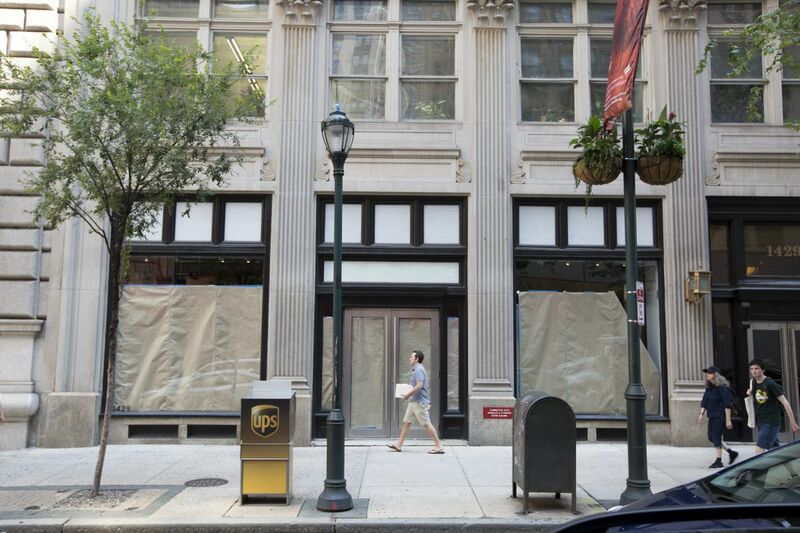 MAC Cosmetics recently secured the former Camper space at 18th and Chestnut Streets for more than $100 per square foot, considered high for Chestnut. But the big difference? It was for a smaller space. Shrunken spaces is the preference now, say brokers. Virtual inventories of former purely online players like Bonobos, Warby Parker, and UnTUCKIT don't need as much space, usually taking smaller footprints of 1,600 square feet or less. The former space of Armani Exchange is being divided into two stores. Target is about to open its fourth small-format store in the city, on Oct. 18. "Expanding retailers know it's a buyers' market," said Cushman & Wakefield's Andi Pesacov, who did the deal last month to take the furniture store CB2 to 1422-24 Walnut St. "So they are demanding in their 'wish lists' from the landlords: lower rent rates, smaller initial terms, larger free-rent periods, etc." She said CB2 took advantage of lowered city rental rates to secure a large space to replace Kenneth Cole, Lacoste, and a physical therapy office. In addition, the high cost of doing business in Center City, with its slew of taxes – including the business income, use and occupancy, city and state property taxes, among others – makes it even harder to fill vacancies. "You have a lot more options east of Broad and neighborhoods to the south starting to open up with more choices that are more affordable than the core Center City," said Catherine Timko, CEO of the Riddle Co., which advises the Center City District on attracting retailers. Fishtown, Passyunk, University City, Fairmount, and other dynamic neighborhoods "are attracting talented restaurateurs or hometown retailers that prefer to be outside the core," said Jacob Cooper, managing director and partner at MSC Retail. Many walked empty-handed through the Rittenhouse Square-area shopping district recently, where vacancies are appearing after an extended retail revival. CBRE executive vice president Larry Steinberg, the listing agent for the Shops at Liberty Place, where Nine West closed last month, is looking for a replacement. "Our high streets – Walnut Street West and Chestnut Street, 16th to 19th Street – are alive and well, just changing from the days of luxury retail," he said. "Luxury is moving to King of Prussia in mass. So where does that leave Center City? New luxury-lite tenants like Michael Kors replace Coach and Burberry." On May 30, Michael Kors announced it will be closing 100 to 125 stores nationally over the next two years, with locations to be determined.